Buy poetrybyjeremy a Coffee. ko-fi.com/poetrybyjeremy - Ko-fi ❤️ Where creators get paid by fans, with a 'Buy Me a Coffee' button. 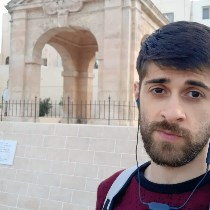 Jeremy Mifsud is a queer & autistic poet from Malta. He has a collection published, along with poetry appearing or forthcoming in several literary magazines, including Terse Journal, Little Lion Literary and Constellate Magazine. As a poet, all support helps me continue striving to improve and submit more work to anthologies and journals worldwide. I also support other writers by providing book reviews to all books I read, and take requests too. A little help can go a long way! Secured Payments. Support goes to poetrybyjeremy's account. My microchap "From the Backseat of a Bus" will be published by Ghost City Press (for free). I'm hiring a friend to design my book cover and would love to pay him in full for his effort. Upgrade poetrybyjeremy to a yearly Gold Membership with a one-time payment.